The Knitting & Stitching Show at Ally Pally (as Alexandra Palace is affectionately known by locals) is one of the highlights of my calendar. For a start, it’s just up the hill from my flat. I can actually see Ally Pally from my bedroom window. There was such a lot to see that I needed every minute I spent at the show. I can’t believe a fortnight has flown by since it opened its doors, but, then again, I’ve been busy since then putting my purchases to good use. Well, that’s my excuse! 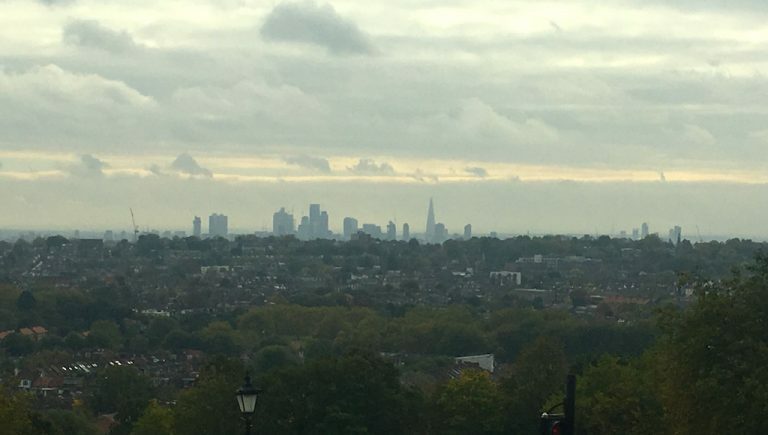 The view from Ally Pally – can you spot the Shard? One of the great things about the Knitting & Stitching Show is that you always have chance to meet amazing people. For example, on the Lady Sew and Sew stand, where Rowan was based, there were different designers on hand every day. I loved Dee Hardwicke‘s gorgeous throw covered in intarsia flowers and foliage. 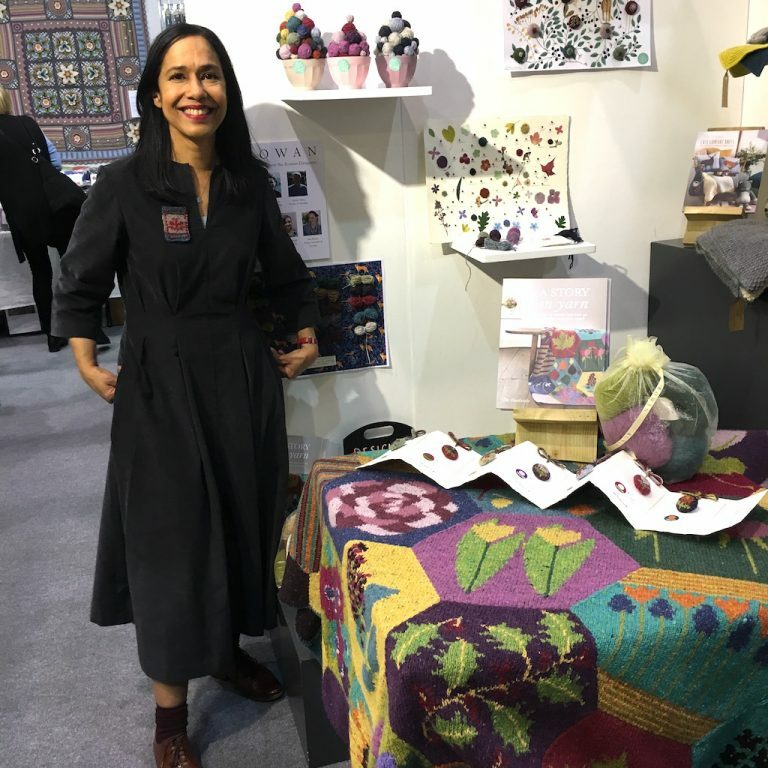 Such a lovely person too, and so happy to share her tips on how to go about creating your own designs. It was also brilliant to say hello again to a friend of mine from my college days. 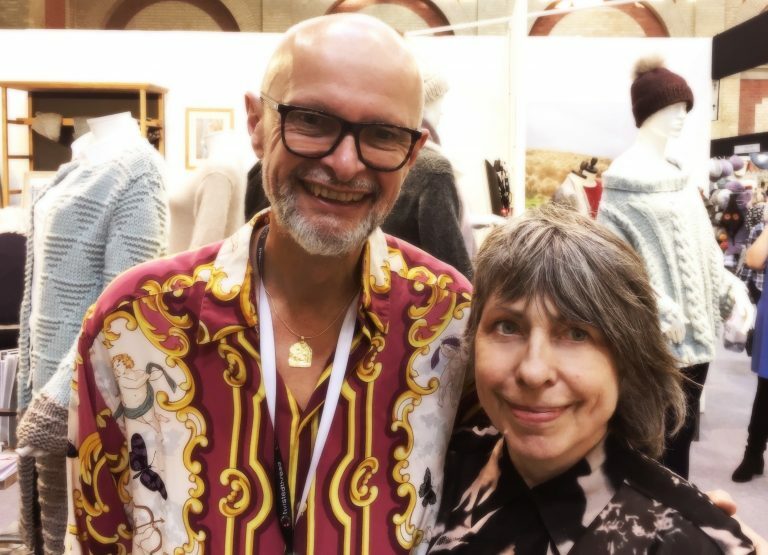 I’m pleased to say that Martin Storey is also one of my favourite designers (I’ve knitted so many of his designs over the years). We had a good old chat, and, of course had our photo taken too! I love the Toft stand every year. The little characters on display are so appealing. No wonder the stand is always so busy. I’m going to be teaching a class on Toft kits at the Village Haberdashery in West Hampstead in November. 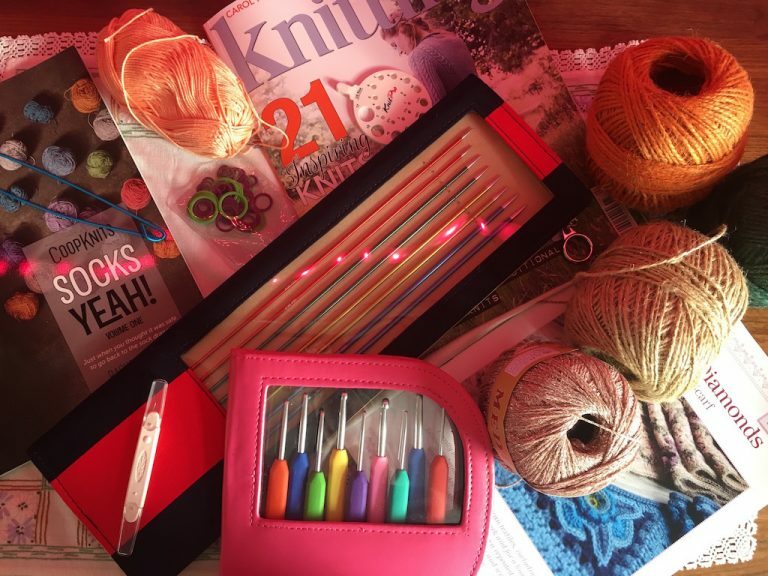 Book your place now and you’ll be able to choose your kit from the full range… (and don’t forget I also teach other crochet classes there. Plenty of granny squares classes and more coming up in Crouch End too). I also went to a talk by Kerry, the brand’s founder, and it was fascinating to hear how she came to begin crocheting her characters. 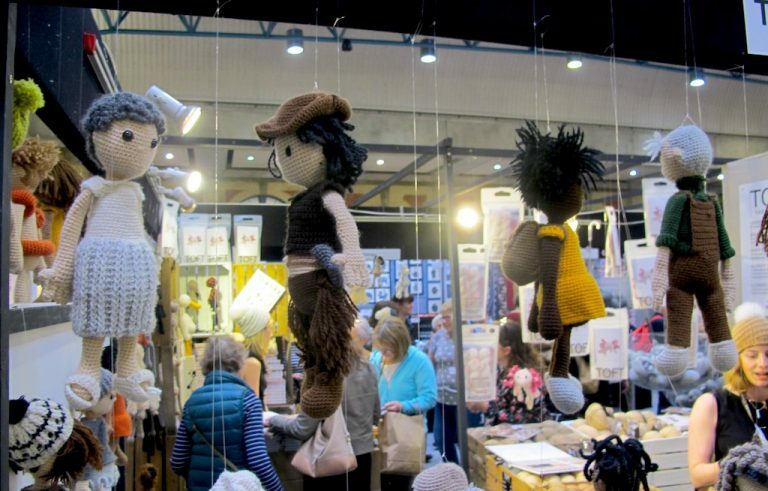 Toft dolls just hanging about at the show! 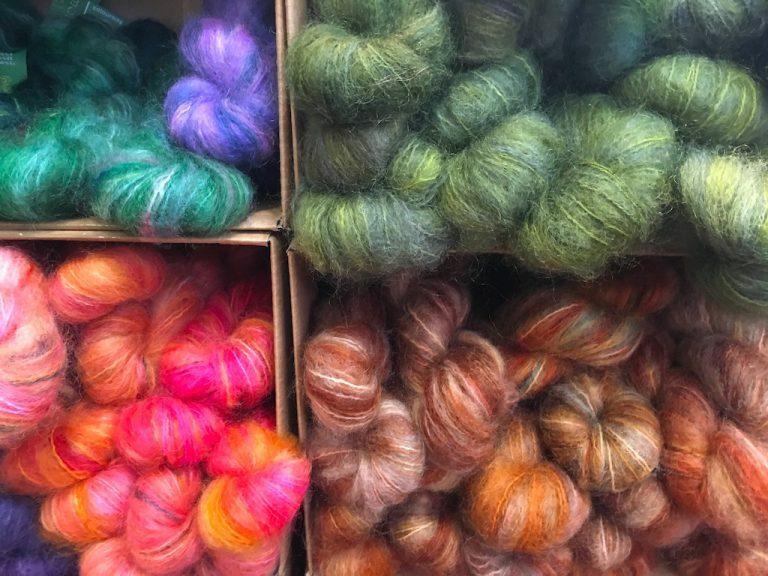 If the yarn wasn’t tempting enough, there is no shortage of inspiration on the pattern front. 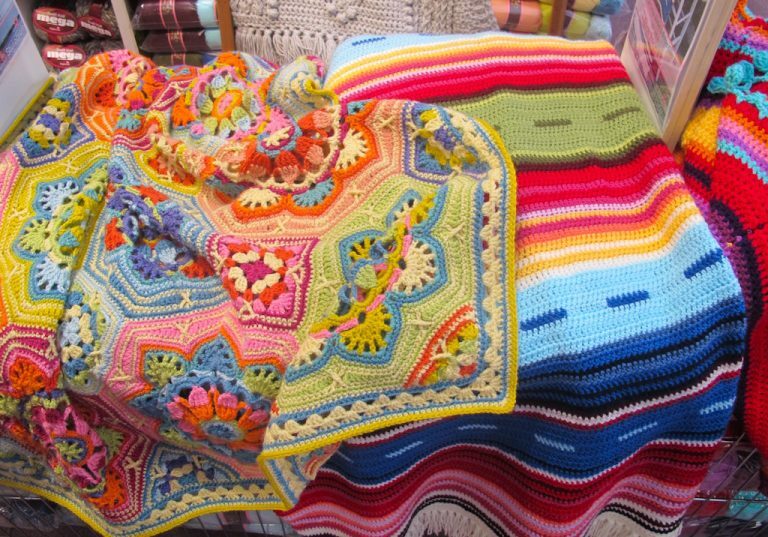 Janie Crow‘s stunning blankets and shawls are intricate delights. I bought a Mexican Diamonds scarf pattern, though who knows when I’ll have the time to start it. There were also crocheted delights on the Stylecraft stand. I do think that a blanket is something to put on my wish list. Another craft to take up? I went to a brilliant talk about selling handmade products by Steffie Stem, one of the owners of The Makerss, who sell cute felting kits. 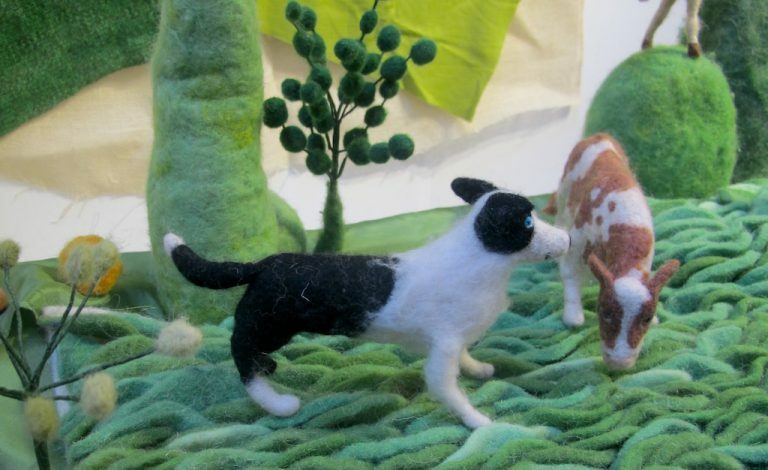 In fact, felted animals seemed to be everywhere. There was an impressive display of Fi Oberon’s work in the Textile Gallery section of the show. Seagulls, penguins, sheep, sheepdogs and more in cute little settings. If only I had the cash! You never know what surprises are round the corner. 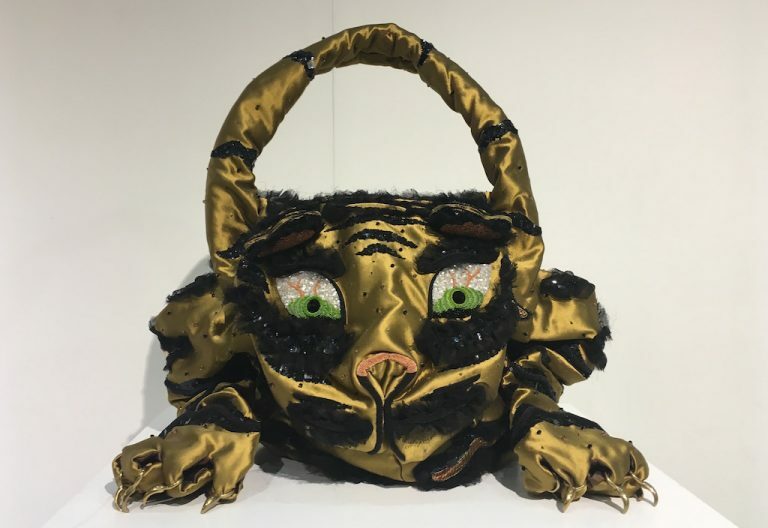 For example, on the way out of the show there was an impressive display of handbags incorporating embroidery, all by hugely influential designers. I particularly liked the cat bag by Vivienne Westwood! A bit beyond my means, though, I think. 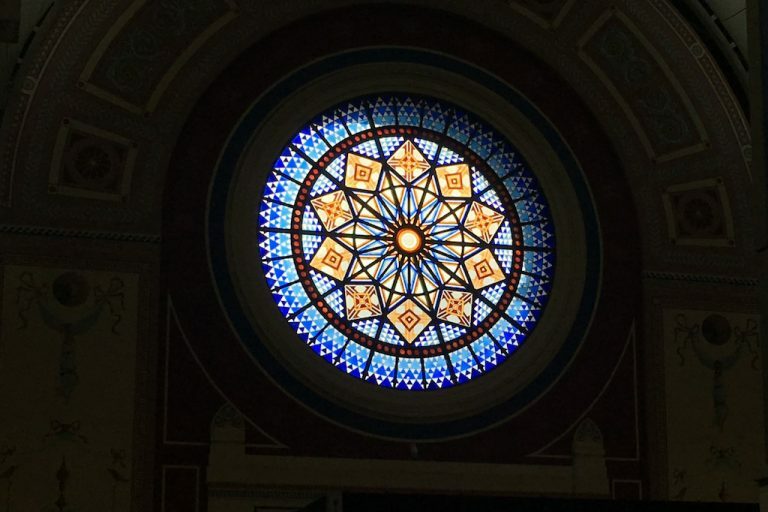 Back home – what did I buy? 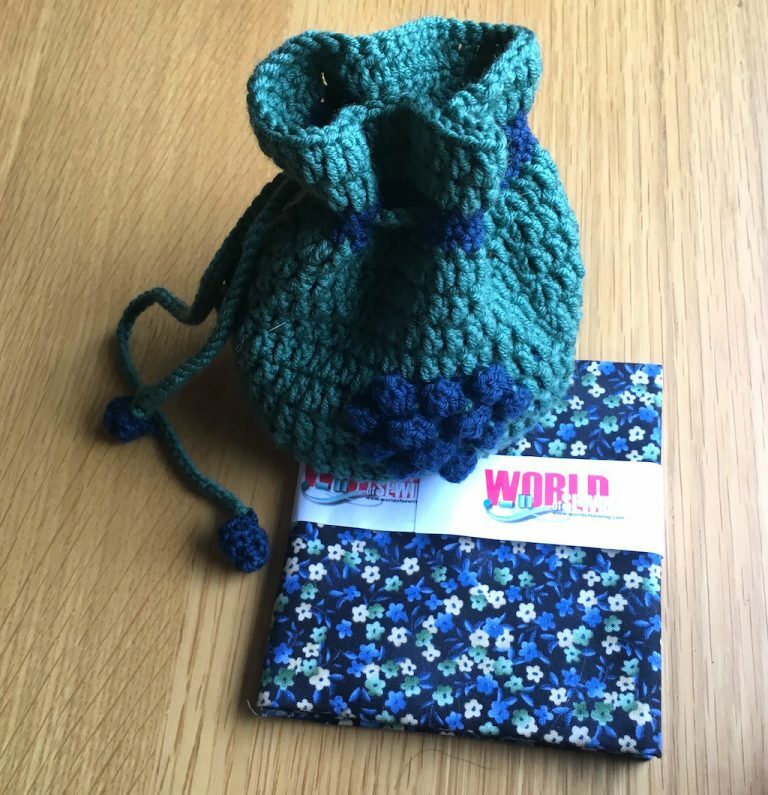 Do you remember the blackberry crochet bag I made a few months ago? Well, the Knitting & Stitching Show provided the perfect opportunity to buy some cotton lining to finish it. There were loads of fabric stalls selling fat quarters for patchwork, so there was plenty to choose from, and I snapped up a piece in colours that matched perfectly. Just need to sew it up now. Here’s some more of my haul. Included are a Socks Yeah! pattern book from Coop Knits, a needle threader (to thread beads onto my crochet cotton for my latest wristbands), a new set of Knitpro crochet hooks, a selection of twine and sparkly thread, a copy of Knitting magazine (I actually took up a subscription to The Knitter and was rewarded with a set of Knitpro needles in a handy case, too! 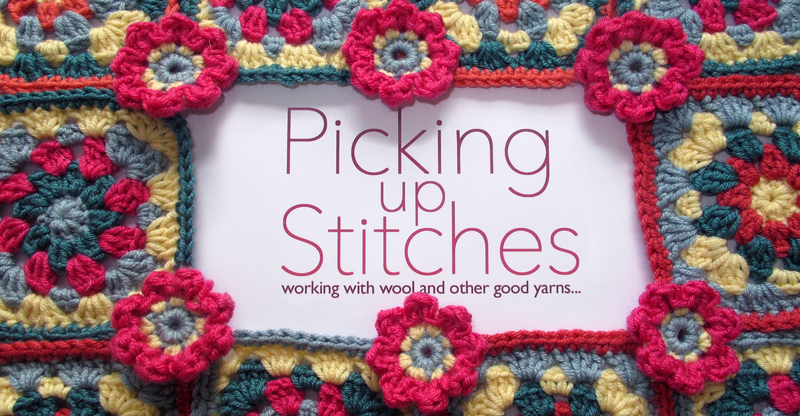 ), some Sheepjes cotton in a peachy shade, stitch markers, a needle-size tester and some ever-handy stitch holders.